Sharp has created a Christmas tree from 43 Aquos LCD TV’s, I wonder how many TVs they used to make this giant Christmas tree. The LCD Christmas Tree stands 26 feet tall and is made up of LCDs ranging in size from 19 to 52 inches. 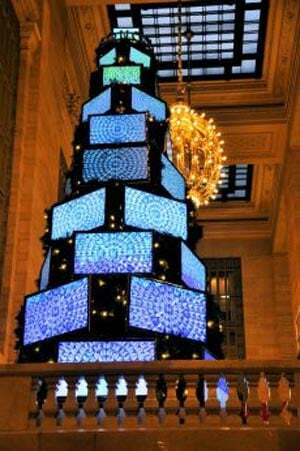 The giant LCD Christmas tree is situated at New York’s Grand Central Station, and it was created by Japanese video artist Tsuyoshi Takashiro. Have a look at out guide which explains the difference between LCD and LED TVs.